INFORMATION, ADVICE, AND ANSWERS TO FREQUENTLY ASKED QUESTIONS, TO MAKE YOUR WORLD WAR II WEEKEND EXPERIENCE EASIER, SAFER, AND MORE ENJOYABLE. LOOKING FOR THE MUSIC? TAKE A RIGHT AT "TUXEDO JUNCTION"
• SEE THE DRIVING DIRECTIONS & MAPS PAGE YOU'LL FIND DETAILED DIRECTIONS FROM VARIOUS CITIES AS WELL AS A SET OF MAPS TO HELP YOU NAVIGATE DIRECTLY TO THE WORLD WAR II WEEKEND PARKING LOTS FROM WHEREVER YOU ARE. • PENNDOT ELECTRONIC SIGNS WILL DIRECT YOU ON RT222 AND RT422. NOTE: DO NOT GET ON BUSINESS ROUTE 222! THE AIRPORT IS NOT IN DOWNTOWN READING! • VOLUNTEER TRAFFIC MARSHALS WILL BE POSTED ON ROUTE 183. THEY WILL DIRECT YOU TO THE SHOW PARKING LOTS, ALL OF WHICH ARE SERVICED BY SHUTTLE BUSES. PLEASE KEEP MOVING AND DO NOT STOP TO ASK QUESTIONS, AS THIS WILL ONLY SLOW THE FLOW OF TRAFFIC. • YOU MAY BE DIRECTED TO REMOTE PARKING AREAS IN CASES OF MUDDY CONDITIONS OR HIGH TRAFFIC VOLUME. PLEASE FOLLOW THE DIRECTIONS OF FIRE, POLICE, AND PARKING PERSONNEL TO A PARKING PLACE. • PLEASE READ ALL SIGNS POSTED ALONG ENTRY ROUTES. TRAFFIC MAY TEMPORARILY FLOW ONE-WAY ONLY. • THERE IS A DESIGNATED LOT FOR HANDICAPPED PARKING. IF YOU DO NOT HAVE HANDICAPPED LICENSE PLATES HAVE YOUR HANDICAPPED SIGN VISIBLE, HANGING FROM YOUR MIRROR. HOWEVER, IF HANDICAPPED PASSENGERS ARE ABLE TO CLIMB ONTO A BUS, THEY WILL GET THE BEST SERVICE BY PARKING IN OUR REGULAR LOTS. THE SHUTTLE BUS WILL DROP YOU OFF RIGHT AT THE MAIN GATE WHERE YOU CAN GET A MOBILITY SCOOTER. • THE MUSEUM PARKING LOT IS RESERVED FOR STAFF AND PREVIOUSLY DESIGNATED SPECIAL GUESTS WITH PASSES, ONLY. • PARKING LOT BUS STOPS ARE MARKED WITH BLUE FLAGS. BUSES STOP ONLY AT THESE MARKED BUS STOPS. PLEASE DON'T ATTEMPT TO FLAG DOWN THE BUSES - THEY WILL ONLY PICK UP AT THE DESIGNATED STOPS, MARKED BY SIGNS OR BLUE FLAGS. • STROLLERS AND WHEELCHAIRS SHOULD BE READY TO FOLD BEFORE GETTING TO THE SHUTTLE BUS, TO AVOID DELAY. • SHUTTLES WILL RUN CONSTANTLY BETWEEN THE PARKING AREAS AND THE GATES. A SHORT WAIT SHOULD BE EXPECTED, ESPECIALLY DURING PEAK IN-FLOW AND OUT-FLOW PERIODS. BUSES WILL CONTINUE TO RUN UNTIL THE CLOSE OF THE DANCES ON FRIDAY AND SATURDAY NIGHT. • ILLEGALLY OR IMPROPERLY PARKED VEHICLES BLOCKING TRAFFIC IN LOTS OR ON THE STREET MAY BE TOWED AT THE OWNERS EXPENSE TO KEEP TRAFFIC FLOWING SMOOTHLY. NOTE THAT ALL PARKING IS AT YOUR OWN RISK. CAMPING IS NOT ALLOWED ANYWHERE IN THE AREA SURROUNDING THE AIRPORT DUE TO LOCAL LAWS. PLEASE NOTE ENTRY & EXIT TIMES AND LOCATIONS! • ALL GATES OPEN EACH DAY AT 8:30 AM. THE PUBLIC WILL NOT BE ADMITTED BEFORE THIS TIME. • THE MAIN ADMISSION GATES (THE FRENCH VILLAGE GATES AND THE #5 RAMP GATE) WILL CLOSE FOR ADMISSIONS AT 5:30 ON FRIDAY AND SATURDAY, AND AT 5:00 ON SUNDAY. • HAVE YOUR ADMISSION MONEY, TICKETS, OR MOBILE DEVICE (FOR E-TICKET SCANNING) READY UPON ARRIVAL AT THE GATE. GATE PRICES ARE: 3-DAY PASS: $90 SINGLE-DAY ADULT : $32, CHILD 6-12 YEARS: $13, CHILD UNDER 6 YEARS: FREE. • PUBLIC ADMISSION WILL CLOSE AT 7:30 PM. AFTER THAT TIME, ONLY THOSE INDIVIDUALS WITH EVENT WRISTBANDS AND/OR HAND STAMPS FROM PRIOR ADMISSION WILL BE ALLOWED ENTRY. • ALL PERSONS AND PARCELS ARE SUBJECT TO SEARCH DUE TO FEDERAL AIRPORT SECURITY REQUIREMENTS. YOUR COOPERATION IS APPRECIATED. PETS, COOLERS*, TENTS, AND ALCOHOLIC BEVERAGES ARE STRICTLY PROHIBITED AND WILL NOT BE ALLOWED THROUGH THE GATES. * SMALL COOLER BAGS FOR WATER OR BABY FORMULA WILL BE ALLOWED. NO PERSONAL MOTORIZED VEHICLES ARE ALLOWED ON THE SHOW GROUNDS, EXCEPT TRADITIONAL HANDICAPPED SCOOTERS. THIS PROHIBITION APPLIES TO SEGWAYS , HOVER BOARDS, AND MOTORIZED KID'S VEHICLES AND SIMILAR DEVICES. DRONES, QUADRA-COPTERS, AND OTHER SIMILAR FLYING OBJECTS ARE PROHIBITED, AND ARE ILLEGAL TO OPERATE WITHIN 5 MILES OF AN AIRPORT BY FEDERAL LAW. DO NOT TOUCH OR CLIMB ON AIRCRAFT OR VEHICLES, OR HANDLE ANY OF THE DISPLAYS WITHOUT PERMISSION OF THE OWNER! • TAKE CARE IN AND AROUND DISPLAYS, ESPECIALLY WITH YOUNG CHILDREN. RE-ENACTORS GO TO GREAT LENGTHS TO PROVIDE THE MOST HISTORICALLY ACCURATE AND REALISTIC REENACTMENT POSSIBLE. MANY OF THE ITEMS THEY DISPLAY ARE FRAGILE OR IRREPLACEABLE. ABSOLUTELY NO SMOKING IS ALLOWED ON THE PAVED RAMP, AIRCRAFT PARKING AREAS ON THE GRASS, OR IN THE MUSEUM BUILDINGS. 100 OCTANE AVIATION FUEL AND FLAMES ARE AN EXTREMELY EXPLOSIVE COMBINATION! • RESTRICT YOUR SMOKING TO THE CLEARLY MARKED, DESIGNATED SMOKING AREA AT THE CORNER OF THE MAIN HANGAR, OUTSIDE THE GLASS DOORS. DO YOU NEED A LITTLE HELP GETTING AROUND THE SHOW GROUNDS? OUR MOBILITY CREW CAN PROVIDE WHAT YOU NEED. CHECK IN AT THEIR BOOTH AT GATE#5, THE RAMP GATE. • SHADE IS LIMITED AND YOU CAN EXPECT TO DO A GOOD BIT OF WALKING TO SEE THE ENTIRE SHOW FIELD. DON'T FORGET YOUR SUNSCREEN, AND PERHAPS AN UMBRELLA OR RAIN JACKET IF THE WEATHER IS THREATENING. SOME GREAT PLACES TO TAKE A BREAK AND GET OUT OF THE ELEMENTS ARE THE MAIN HANGAR, THE BRIEFING TENT, THE BASE CLUB, AND THE VICTORY THEATER. SOME OF THE FLEA MARKET VENDORS ALSO HAVE BROWSING SPACE UNDER COVER. WHATEVER THE WEATHER, WWII WEEKEND WILL GO ON. WE CANNOT SIMPLY POSTPONE IT UNTIL THE NEXT SUNNY WEEKEND. AIRSHOW AIRCRAFT, ENTERTAINERS, VENDORS, SPECIAL GUESTS, RE-ENACTORS AND THEIR VEHICLES, AND JUST ABOUT EVERYTHING ELSE YOU WILL SEE, ARE SCHEDULED, CONTRACTED, AND BOOKED MONTHS IN ADVANCE - LONG BEFORE THE AIRSHOW SEASON EVER BEGINS. 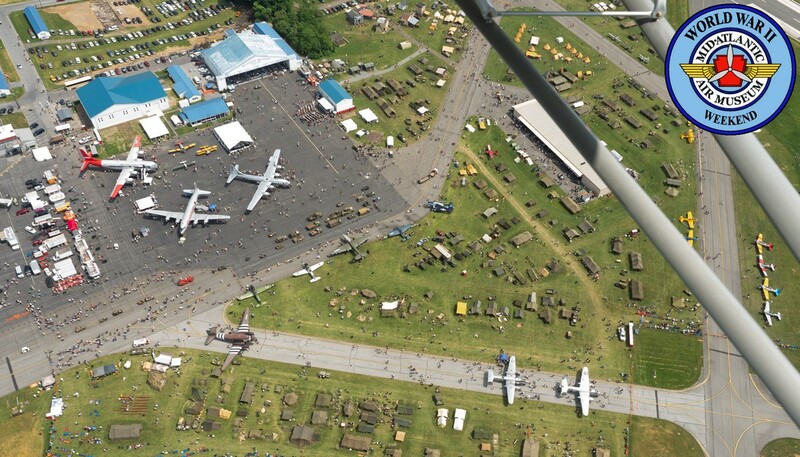 IT IS UTTERLY IMPOSSIBLE TO RESCHEDULE AN EVENT AS MASSIVE AND COMPLICATED AS WWII WEEKEND, OR INDEED, ANY MAJOR AIRSHOW, BECAUSE OF INCLEMENT WEATHER; THERE ARE NO SPARE WEEKENDS ON THE AIRSHOW CIRCUIT. NO REFUNDS CAN BE GIVEN. • WHILE WE ARE TALKING ABOUT COMFORT, FEEL FREE TO BRING ALONG YOUR OWN LAWN CHAIRS TO WATCH THE AIR AND BATTLE DEMONSTRATIONS. MEETING SOMEONE AT THE SHOW? • DUE TO WEATHER, TIME OF DAY, TRAFFIC, AND OTHER FACTORS, YOU MAY NOT ARRIVE AT THE SAME GATE AND TIME AS YOUR FRIENDS. PLAN TO MEET SOMEWHERE INSIDE THE SHOW. THE MAIN HANGAR IS THE MOST VISIBLE LANDMARK ON THE SHOW GROUNDS, AND THERE IS LOTS TO SEE WHILE YOU WAIT FOR THE "TAIL-END CHARLIE'S". 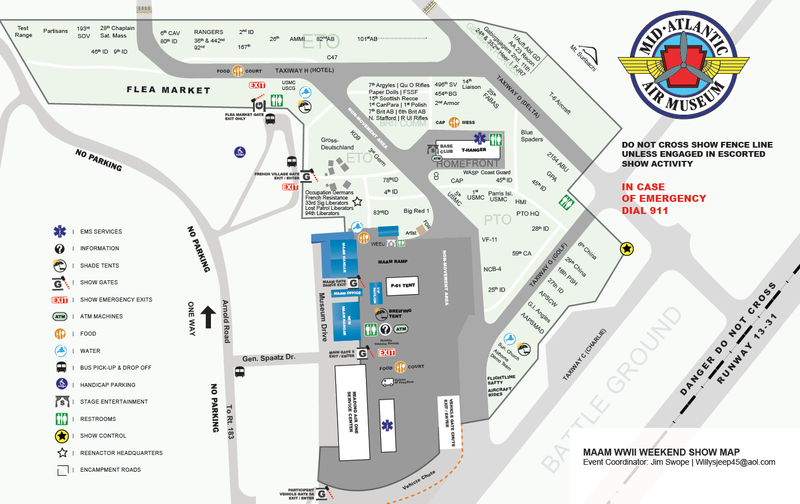 • THE WWII WEEKEND MAP OF THE SHOW LAYOUT SHOULD HELP YOU ARRANGE YOUR RENDEZVOUS, OR JUST FIND YOUR WAY AROUND THE SPRAWLING GROUNDS. YOU MAY PRINT IT IN ADOBE PDF FORMAT, (BELOW) OR ACCESS IT ON YOUR MOBILE DEVICE BY TAPPING THE SHOW MAP BOMB LINK ON THE WWII WEEKEND HOME PAGE. • WHILE MANY VENDORS ACCEPT CREDIT CARDS, SOME MAY NOT ACCEPT DEBIT CARDS. WE PROMISE EVERYONE TAKES "GREENBACKS", THOUGH, AND IT WON'T COST YOU ANY RATION COUPONS! • IF YOU RUN LOW ON YANKEE DOLLARS, THERE WILL BE TWO ATM MACHINES TO RESUPPLY YOU. ONE ATM TRAILER IS NEAR THE MAIN GATE 5 AND THE OTHER IS IN THE HOME FRONT AREA, NEAR THE BASE CLUB. • DON'T FORGET TO PICK UP A COPY OF THIS INFORMATIVE COLLECTOR'S ITEM. THE "WAR NEWS" MAGAZINE IS MUCH MORE THAN A SOUVENIR, THOUGH. ALONG WITH THE BIOS OF OUR SPECIAL GUESTS AND PERFORMERS, YOU WILL FIND THE MOST COMPLETE SCHEDULE OF EVENTS AT THE WWII WEEKEND SHOW. STILL ONLY $5.00, IT'S AVAILABLE AT THE GATE OR THE MAAM PX TENT ON THE MAAM RAMP. • ORDER THIS YEAR'S SHOW TEE-SHIRT WHEN YOU ORDER YOUR ADVANCE TICKETS , OR PICK ONE UP AT AT THE MAAM PX TENT ON THE FIELD. BUT DON'T WAIT UNTIL THE END OF THE DAY, AS THIS POPULAR ITEM SELLS OUT QUICKLY. • HERE IS A LIST OF MAAM RECOMMENDED HOTELS. ALSO, PLEASE SEE OUR VISITING THE MID-ATLANTIC AIR MUSEUM PAGE FOR INFORMATION AND LINKS TO ACCOMMODATIONS AND RESTAURANTS IN THE AREA. • THOSE NOT ATTENDING THE MAIN SHOW, BUT WHO ARE COMING FOR THE FRIDAY AND SATURDAY DINNERS AND DANCES WILL BE ADMITTED NO SOONER THAN 5:30 PM. ADMISSIONS GATES WILL CLOSE PROMPTLY AT 7:30 PM FOR ANY NEW ARRIVALS. • ADMISSION WILL BE VIA THE MUSEUM GATE, ONLY, LOCATED BETWEEN THE MUSEUM OFFICE AND THE MAIN HANGAR. 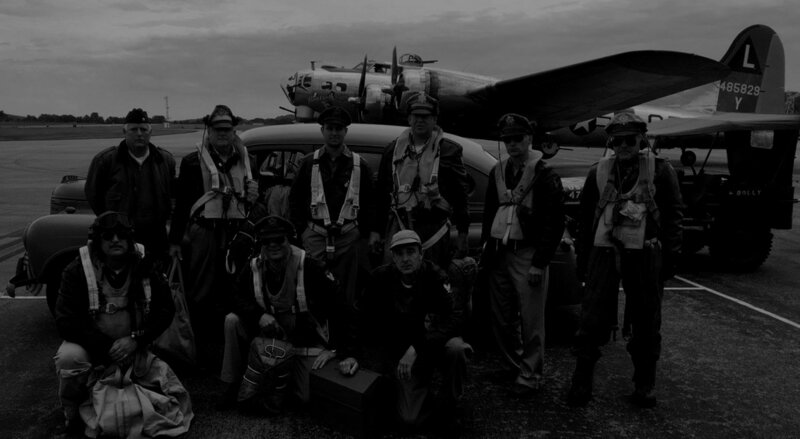 • EACH PERSON ENTERING MUST PURCHASE AN EVENING ENTERTAINMENT TICKET FOR $15 AT THE MUSEUM GATE BETWEEN 5:30 AND 7:00 PM, OR PRESENT A REGULAR WWII WEEKEND SHOW TICKET FOR THAT DAY. • THE HANGAR DANCES END AND THE SHOW CLOSES AT 10:PM ON FRIDAY AND SATURDAY. • HEADS UP: DINNER TICKETS ARE SOLD IN ADVANCE ONLY. EVENING ENTERTAINMENT TICKETS MAY ONLY BE PURCHASED AT THE GATE . FRIDAY AND SATURDAY SHOWS END AT 10:00 PM, AFTER THE HANGAR DANCES. THE SUNDAY SHOW ENDS AT 5:00 PM. • SEPARATE BUS LOOPS WILL BE USED FOR THE VARIOUS PARKING LOTS DURING THE HOURS OF 8:30AM AND 6:30PM ON SATURDAY. PLEASE EXIT THE SHOW FROM THE SAME GATE THAT YOU ENTERED TO ASSURE YOU GET ON THE RIGHT BUS. ALL BUSES GO TO ALL LOTS ON FRIDAY AND SUNDAY. • AFTER 6:30PM, AND AFTER THE FRIDAY AND SATURDAY HANGAR DANCES, YOU MUST EXIT THROUGH THE MUSEUM GATE ADJACENT TO THE HANGAR TO CATCH SHUTTLE BUSSES TO ALL LOTS. ALL OTHER EXITS WILL BE CLOSED AT THAT TIME. • INSTEAD OF "HURRY UP AND WAIT", WE SUGGEST YOU GET A BITE TO EAT, OR TAKE A LEISURELY LOOK AT THE FRENCH VILLAGE AND THE ENCAMPMENTS. IF YOU ARE A SHUTTERBUG, THIS IS YOUR CHANCE TO FIND YOUR FAVORITE AIRCRAFT ON THE GROUND FOR A CLOSE-UP SHOT IN THE LOVELY EVENING LIGHT. PLEASE DO NOT TOUCH THE AIRCRAFT. ALL OF THESE ACTIVITIES ARE MUCH MORE PLEASURABLE THAN A LONG, BORING WAIT IN A BUS LINE, FOLLOWED BY AN AGGRAVATING TRAFFIC JAM ON THE HIGHWAY. • THE VERY BEST WAY TO AVOID THE EXIT RUSH ON FRIDAY AND SATURDAY EVENINGS IS TO STAY AND ENJOY PART OR ALL OF THE LIVE DANCE BAND PERFORMANCE, FREE OF CHARGE. THEN YOU CAN LEAVE IN THE COOL OF THE EVENING, AFTER RUSH-HOUR. • DIDN'T FIND THE ANSWER TO YOUR QUESTION? WELL, IF YOU LOOK AROUND AT THE VARIOUS OTHER PAGES OF THE MID-ATLANTIC AIR MUSEUM WORLD WAR II WEEKEND WEBSITE BY USING THE BOMB LINKS ON THE RIGHT SIDE OF THE WORLD WAR II WEEKEND FRONT PAGE, YOU PROBABLY WILL. IF NOT, YOU CAN CALL THE MUSEUM AT (610) 372-7333 DURING BUSINESS HOURS, 9:30 AM TO 4:00 PM, OR SEND US AN E-MAIL. • PLEASE KEEP IN MIND THAT AS SHOW TIME DRAWS NEAR, IT BECOMES INCREASINGLY DIFFICULT TO CATCH UP WITH E-MAILS. ALSO, THE OFFICE WILL BE CLOSED ON FRIDAY THROUGH MONDAY DURING THE SHOW WEEKEND AND THE PHONE WILL NOT BE MANNED. NORMAL OPERATIONS WILL RESUME ON TUESDAY, AFTER THE SHOW AND CLEAN-UP DAY. • YOU MAY ALSO OBTAIN WWII WEEKEND SHOW INFORMATION FROM THE GREATER READING CONVENTION AND VISITORS BUREAU. THEY WILL BE MOST HAPPY TO ASSIST YOU WITH DIRECTIONS, A VISITORS GUIDE, HOTEL INFORMATION, AND MAP BASIC INFORMATION. THE VISITOR'S CENTER PHONE NUMBER IS 610-375-4085 OR 1-800-443-6610. OR YOU CAN E-MAIL THEM AT INFO@READINGBERKSPA.COM . The staff and members of the Mid-Atlantic Air Museum, visiting aircrews, re-enactors, and the many volunteers who help make the show ‘THE BEST WORLD WAR TWO SHOW, BAR NONE!' thank you for your support, and hope you enjoy MAAM'S WWII WEEKEND! HOW ABOUT ANOTHER SWINGING TUNE? TAKE IT EASY, MAC!